Real Madrid are on course to make the Champions League quarterfinals after a 2-0 victory at Schalke in the first leg of their last-16 tie. Schalke went into the game as huge underdogs, having lost 6-1 at home and 3-1 away when they met Madrid at the same stage in last year’s competition, but they had looked the more likely to make the breakthrough at the start of the match. However, the home side found themselves trailing on 26 minutes when Cristiano Ronaldo was allowed the space to head home for his 58th goal in 58 Champions League appearances, the Portuguese ending a goal drought that had approached five hours. Schalke’s prospects then receded further when former Madrid forward Klaas-Jan Huntelaar had to be substituted before the break with a leg injury. However, Huntelaar’s replacement, Felix Platte, came close to an equaliser on his Champions League debut as he smashed a shot against the crossbar on 74 minutes, with Atsuto Uchida unable to beat Iker Casillas from the follow-up. Soon afterwards, Madrid had extended their advantage, with Marcelo unleashing a stunning right-footed strike into the top corner. 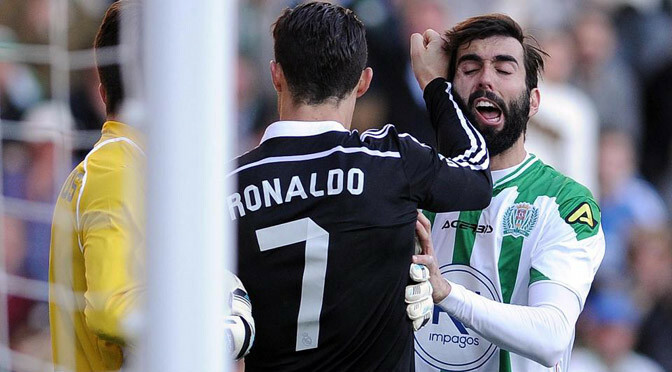 Cristiano Ronaldo was sent off for lashing out at Edimar as Real Madrid beat Cordoba 2-1 thanks to a dramatic late Gareth Bale penalty. Cordoba took an early lead when Bebe fired a shot from distance against the arms of Sergio Ramos, and the referee awarded a penalty. Nabil Ghilas calmly converted from the spot. Real struggled to create many chances in response, but Karim Benzema equalised after stabbing home Gareth Bale’s flick-on from a James Rodriguez corner. In the second half, Cordoba continued to play brightly, despite gradually dropping deeper, and they almost took the lead against when Florin Andone lifted a volley over the head of Iker Casillas, only to see his effort bounce off the crossbar. Real Madrid went close when Juan Carlos saved Benzema’s shot from the left, but minutes later Cristiano Ronaldo saw red for kicking out at Edimar after the two tussled for a cross, and also became involved with Jose Angel Crespo. Minutes later, Bale won a penalty when Federico Cartabia was given a second yellow after he handballed his free kick. He fired his shot down the middle to win the game with minutes to spare. Fernando Torres struck his first goals since returning to Atletico Madrid, firing a brace in a 4-2 Copa del Rey aggregate win over holders Real Madrid. Atletico led 2-0 from the first leg and Torres stunned the Bernabeu, smashing in left-footed after 49 seconds. Sergio Ramos’s header levelled but, in the first minute of the second half, Torres beat Pepe to slide in a second. Real needed three goals to win after Cristiano Ronaldo’s header but Atleti will meet Barcelona in the last eight. Barca cruised to a 9-0 aggregate win over Elche, but for Atleti, the last-16 stage provided a stiffer test and significant bragging rights. The La Liga champions inflicted a first domestic cup defeat on Carlo Ancelotti since he arrived to manage their city rivals in 2013. Los Rojiblancos can also boast being five games unbeaten against Real this season, a record which looked certain to continue after less than a minute’s play in the Spanish capital. Soon after Ronaldo stopped parading his Fifa Ballon d’Or award moments before kick-off, Torres plundered the opener, sweeping into the top corner from 10 yards with a first-time shot following Antoine Griezmann’s cross. Torres, who left Atleti in 2007, had never scored at the Bernabeu with his boyhood club but, in for the unwell Mario Mandzukic, he left Real needing four goals to progress. Ramos netted a last-minute leveller which spurred Real on to a 4-1 extra-time win over Atletico in last season’s Champions League final and he was in the right place when goalkeeper Jan Oblak – making just his fifth appearance – flapped at a set-piece delivery. Swarms of white shirts peppered the visitors’ area and Ronaldo’s goal-bound strike was only kept out by Mario Suarez on the goal-line as Real dominated with 76% of possession in the opening half. But Diego Simeone’s side only had 27% of the ball in the first leg and they again demonstrated the resilience he has instilled in them since taking over in December 2011. The Argentine has delivered successive league finishes of fifth, third and first along with Europa League success in 2012 and a Copa del Rey triumph in 2013. In Europa League, Champions League and Copa del Rey fixtures, he now has 16 successes from 18 two-legged ties and Torres’s second came at the perfect time, killing Real’s second-half hope. He again collected a Griezmann pass before wrong-footing Pepe to fire under home keeper Keylor Navas. Ronaldo – voted the greatest player in Portugal’s history on Wednesday – headed in from six yards to reduce the arrears on 54 minutes before Torres was substituted to jeers from the home fans. Karim Benzema could not turn their frustration to hope when he fired over from four yards as La Liga leaders Real relinquished their hold on Spain’s coveted domestic cup. Cristiano Ronaldo is officially the world’s best player for the second straight year as he received the 2014 FIFA Ballon d’Or. The Real Madrid and Portugal forward was awarded FIFA’s top individual honour over Barcelona forward Lionel Messi and Bayern Munich goalkeeper Manuel Neuer. Ronaldo, 29, took home the award for the third time in his career, after also winning it in 2008. He and Messi have been the only players to receive the award since then, with the Argentine earning the honour for four straight years from 2009-2012. The Portuguese earned 37.66 percent of the votes, while Messi edged Neuer, 15.76 to 15.72 percent, for runner-up. Ronaldo set a record by scoring 17 goals in last season’s Champions League, guiding Madrid to their 10th title, the long-awaited La Decima. He scored twice in the semifinals against Bayern Munich and the crowning goal in the final against Atletico Madrid. This season, he has scored a remarkable 26 goals in 16 games in La Liga, and an additional five goals in six Champions League games. Ronaldo did have a relatively disappointing World Cup, scoring once in three games as Portugal were eliminated in the group stage after failing to beat Germany and the United States. Neuer was a key part of Germany’s run to the World Cup title, and received plaudits for his consistent willingness to leave his penalty area to clear loose balls. Messi was awarded the Golden Ball at the World Cup after scoring four goals and playing a decisive role in taking Argentina to the final. He also became the all-time leading scorer in La Liga (259 goals) and the Champions League (75 goals) last year. The Ballon d’Or was presented solely by France Football until 2009, and the publication joined with FIFA’s World Player of the Year Award from the 2010 edition. All three Ballon d’Or finalists were also named to the FIFPro World XI earlier on Monday. 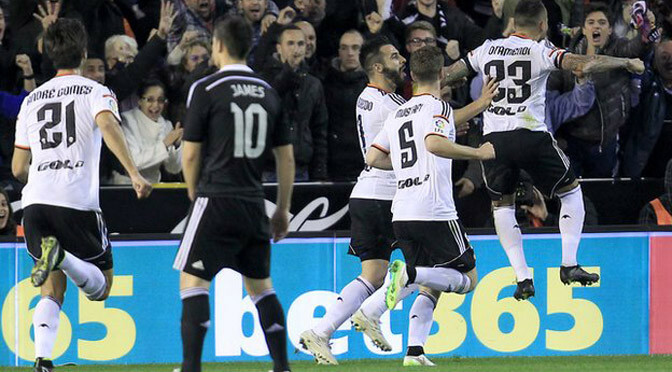 Real Madrid’s club record 22-match winning run was ended, as Valencia came from behind to secure a famous victory. 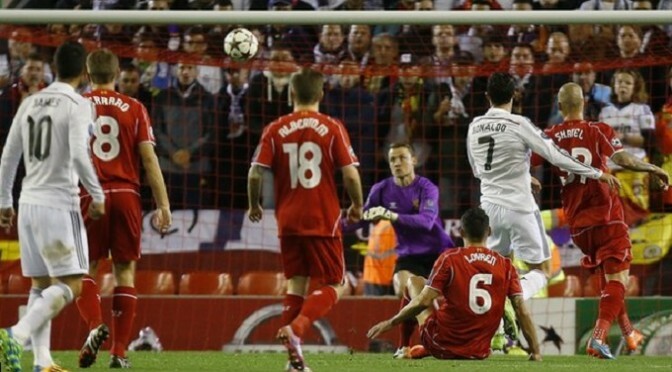 Cristiano Ronaldo’s penalty put Real in front, his 33rd goal of the season. But Valencia made it 1-1 seven minutes into the second half through Antonio Barragan’s deflected shot. Otamendi then powered the ball in from a corner but Madrid stayed top of La Liga thanks to Barcelona’s 1-0 defeat to David Moyes’s Real Sociedad. It was Real’s first defeat since they lost to city rivals and La Liga champions Atletico Madrid on 13 September. The result lifted Valencia, beaten just once at home all season, into the Champions League places. Carlo Ancelotti’s side would not have envisaged that scenario when they took an early lead through Ronaldo. After Gareth Bale had been fouled, a free-kick from Tony Kroos was flicked on by Bale against the arm of on-loan Manchester City striker Alvaro Negredo. Ronaldo converted from the spot but then missed an excellent chance to double Real’s lead when he rounded goalkeeper Diego Alves but, from a tight angle, shot into the side netting. Valencia had five players booked in a niggly first half but struck a post through a deflected Andre Gomes shot in stoppage time. And they were the better side in the second half, levelling when former Liverpool player Barragan scored his first league goal for the club with a shot which was diverted past Iker Casillas by defender Pepe. Bale was then denied by an excellent Otamendi tackle at the other end before the Argentina international won it with a towering header with 25 minutes to go. Negredo impressed for Valencia, who could have spared themselves some anxious late moments, notably when Isco’s close-range header was saved by Alves, had Barragan not wasted another excellent chance when he shot wide with just Casillas to beat. Holders Real will now be looking to bounce back against their local rivals in the first leg of their Copa del Rey last-16 tie on Wednesday night, when Fernando Torres could make his first appearance since re-joining Atletico on loan. Liverpool were given a painful lesson in how far the Champions League has moved on in their absence as they were completely outclassed by holders Real Madrid at Anfield. Television screens inside Anfield’s lounges relived Liverpool’s 4-0 win against Real in the last 16 in 2009 in an attempt to set the mood before kick-off – but there was never any hope of a repeat. Cristiano Ronaldo led Real’s charge with a superb opener after 23 minutes and Karim Benzema added two before the interval to leave the hosts facing a desperate exercise in damage limitation. It was the first time Liverpool had been three down at half-time at Anfield in their long and glorious European history – a fact no doubt noted by Real coach Carlo Ancelotti, who was in charge of AC Milan in Istanbul in 2005 when the Reds claimed the Champions League after facing a similar heavy deficit at the interval. Here, in contrast, the Italian was able to enjoy a comfortable second half as Liverpool manager Brendan Rodgers’s brave pre-match words about not being underdogs were put into context. With just three points from their opening three games, Liverpool’s ambitions of reaching the knockout stage of a competition they cherish so much are in real peril. And the performance of Mario Balotelli meant it was another night that left question marks over Liverpool’s decision to pay £16m for a striker who simply does not deliver when it matters. Cristiano Ronaldo scored twice as Real Madrid claimed the first European silverware of the season with a 2-0 Super Cup win over Sevilla in Cardiff. Ronaldo, starting alongside new recruits James Rodriguez and Toni Kroos, tapped in a cross from Cardiff-born Gareth Bale to give Real the lead. The Portuguese doubled his side’s advantage with a drilled shot from the left when played in by Karim Benzema. It is the first of six trophies Real are hoping to win this season. The Champions League winners will look to defend the title they claimed by beating Atletico Madrid in May, while Bale said this week the team are also confident of winning La Liga, the Copa del Rey, the Fifa Club World Cup and the Supercopa de Espana in 2014-15. This match against fellow Spanish side Sevilla, who won the Europa League by beating Benfica on penalties, was a first chance for manager Carlo Ancelotti to see the most expensively-assembled squad in football history in action in a competitive match.